Suns InterchangeCharlie Dixon off due to an injury. GOAL DOCKERSCrozier, on the left boot, lets one rip from 45 with a snap around the body and it flies right through the middle of the sticks! Dockers draw first blood. A solid start by the Suns who are applying some great pressure in defence but have yet to mount any real attack. BEHIND DOCKERSGreat courage from Crowley as he has eyes only for the ball and takes a superb mark 35m out, directly in front. He hits the woodwork and lets the Suns off the hook. Some early aggression from Ablett and Crowley with the two going headto-head, and we can expect that for the entire night. For 8thplaced Freo, this is a pivotal game if it is to feature in September, but the Suns have made an impressive start to the season and certainly have the potential to cause an upset. Underway! Welcome to Metricon Stadium for this intriguing battle between the Suns and Dockers. No late changes for either squads and the starting substitutes are Aaron Hall and Cameron Sutcliffe. Welcome to Metricon Stadium for the Gold Coast Suns v Fremantle Round 6 clash. A DEPLETED Fremantle has strangled the life out of Gold Coast and cruised to a comfortable 45-point win at Metricon Stadium on Saturday night. The Dockers kicked the first four goals of the match and held that advantage for most of the night, being rarely troubled in winning 15.9 (99) to 7.12 (54). Despite missing key players Aaron Sandilands (hamstring), Matthew Pavlich (Achilles), Nat Fyfe (suspended) and Stephen Hill (quad), the Dockers did what they do best – harassed, tackled, competed and eventually won. Michael Walters was the spark-plug up forward, kicking three of his four goals in the third quarter to keep the Suns at bay. 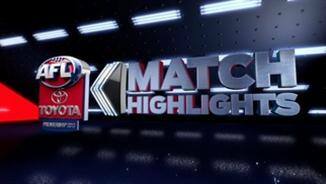 They won thanks to an even midfield contribution from David Mundy (22) Nick Suban (21) and Michael Barlow (20), while ruckman Jonathon Griffin was a strong forward presence, finishing with three goals. 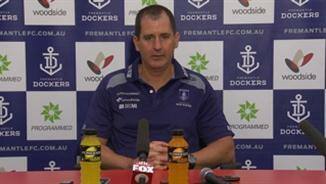 Fremantle coach Ross Lyon it was a good win against an improving Suns outfit. "It was a really pleasing performance from start to finish," Lyon said after the game. "We have big challenges coming up and our midfielders really stood up and we showed strong leadership throughout. We bank the four points and go on." 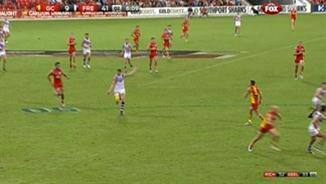 Gold Coast won most statistical categories but rarely looked like troubling the visitors, who successfully set up a spare man – usually Garrick Ibbotson who finished with 22 touches - one kick behind the play. 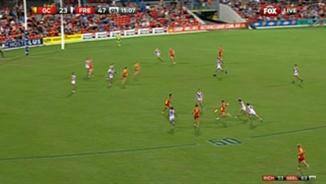 The Suns could not figure out the jigsaw despite winning the disposal count (348-333), clearances (43-31), contested possessions (139-138) and going inside 50 an equal 45 times. 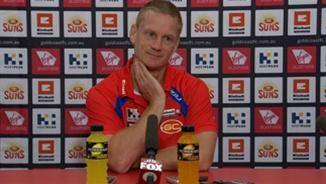 Suns coach Guy McKenna said his team's shortcomings were obvious. "Clearly their pressure was better than ours. Our poise was non-existent almost," he said. The victory moves Fremantle to a 4-2 record ahead of next Saturday night's huge match-up with Collingwood at Patersons Stadium. One of the most intriguing battles of the night was Ryan Crowley's duel with Suns skipper Gary Ablett. There's no love lost between the pair, with Ablett calling the Freo tagger a "joke" on Twitter last year for his niggling tactics against Carlton superstar Chris Judd. 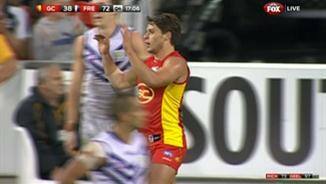 Ablett and Crowley were into each other from the opening minutes, including plenty of ground-level wrestling. Crowley initially got under Ablett's skin as the Brownlow medallist gave away a couple of free kicks, but the champion midfielder responded and finished with 28 disposals, 21 of them contested, and one goal. Most of his disposals were under heavy pressure though, and Lyon was pleased with Crowley's job. 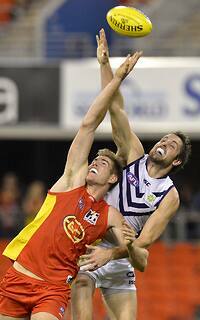 For the Suns, Jarrod Harbrow was superb with 32 disposals, while David Swallow was terrific off half-back. 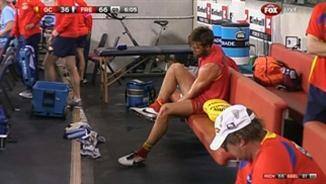 Last week's six-goal star Charlie Dixon was subbed off in the third quarter with an ankle injury, but McKenna said it was not serious. 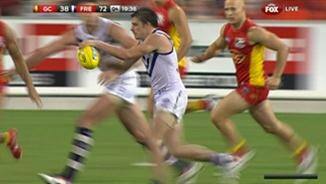 Fremantle: Cameron Sutcliffe replaced Alex Silvagni during the fourth quarter.